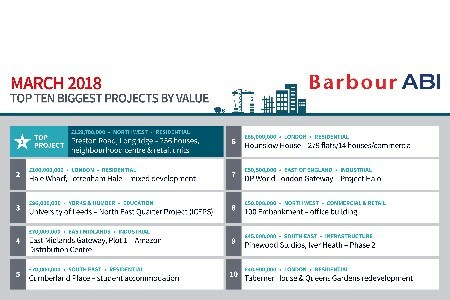 Barbour ABI, a leading provider of construction intelligence services, has announced that infrastructure construction contracts have reached an all time low in March. The company's latest edition of the Economic & Construction Market Review highlighted the levels of construction contract values awarded across the UK. While the residential construction sector continues to dominate with a contract figure of £2.4 million, its highest figure in seven months, infrastructure construction contract figures have decreased by 26% compared to the previous month, its lowest figure since 2010. The largest value contracts in March were both residential developments, including the Longridge neighbourhood centre which includes 256 houses and valued at over £160 million, however there was a distinct lack of infrastructure projects across the top ten biggest projects, with the sole project worth £45 million enabling works of Phase 2 for Pinewood Studios, awarded to Sir Robert McAlpine. Looking across the rest of the industry, outside of infrastructure, every other sector saw an increase in March for contract values compared with February. The biggest increase came in medical and health construction, which reached the significantly higher figure of £200 million in March. The South East led all regions with contract award value at 18.5% of the UK total, largely thanks to the £70 million Cumberland Place student accommodation project and the aforementioned Pinewood Studios project. This was followed by the North West with 15.9% of the contract award value and London with a 14.6% share. “The continuous decline of infrastructure construction contracts and in particular big ticket infrastructure projects will not help to repair the sliding confidence across the industry, which is masking better growth across the other sectors of the industry, particularly the encouraging figures coming from medical and health construction and the strong growth from residential construction," said Michael Dall, Lead Economist at Barbour ABI.